If you find joy in long lunches, food and wine, then there’s a new kid in town you need to check out! Set in the seaside location of Kingscliff, you will find a charming whitewashed cottage with a peppermint door. This place is called “Taverna”. This new restaurant is the brainchild of Lia and Mark Wilson along with Lee Middendorf. They are the same team behind The Sandbar and Grill which they revived in 2010 and renamed as Osteria, an Italian-inspired meeting place in Casuarina. Due to their passion and inspiration from their travels to Greece and Italy, the team is offering a new dining experience in the form of a Greek-inspired Taverna. The small restaurant’s menu is designed for sharing and all are made from the freshest local produce which are carefully crafted bringing out the best Greek flavours. 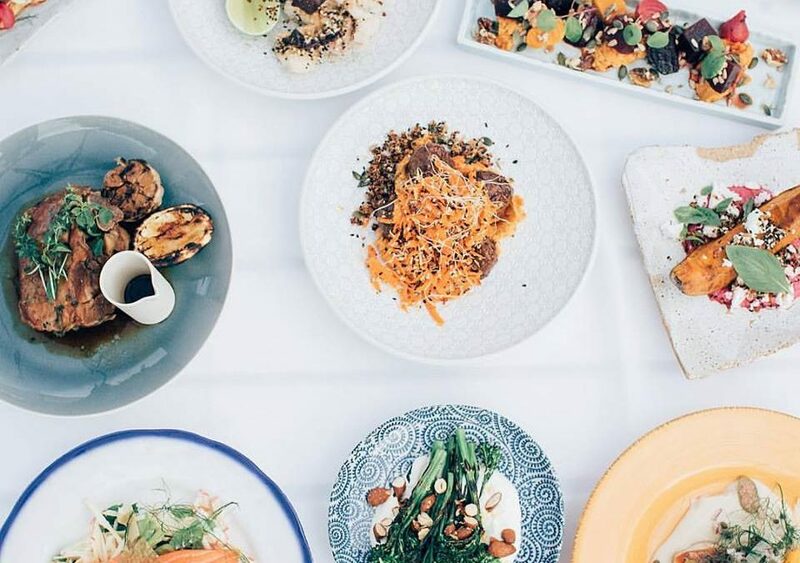 Start with their creative selection of small plates which includes – Byron Bay haloumi with bush honey & rosemary, Greek style beef tartare with egg & dark rye toast and Lamb kofta with ancient grains, carrot & coconut salad. If you love seafood, they serve charred WA octopus with fava bean whip and sweet pickled vegetables. Taverna also offers a fried local squid with seaweed, sesame, pink peppercorn mayo and lime. Every bite of this dish will definitely send you on a delicious journey. Taverna continues to delight your taste buds with their large sharing plates. So get ready to share their slow roasted New England lamb with jus, soft garlic & oregano or try their version of confit ocean trout with broad bean, artichoke heart, goats cheese, apple & mint salad. Your friends or family will surely love the grilled white fish with cauliflower skordalia, capers, fennel & wild orange. For the health conscious, Taverna serves vegan Moussaka with cashew fetta & leaves as well as fried skin organic chicken with pickled chilli, lemon & herbs. Now for some tasty desserts to finish off your lovely meal. You can choose from Taverna’s sweet fruity delights such as watermelon sorbet and grilled stone fruit with soft jersey cream, meringue & sesame praline. Chocolate lovers are in for a treat with the restaurant’s dark chocolate & olive oil pot with Persian floss and fresh berries creation. How about some burnt honey brulée with figs, macadamia & saffron biscotti or a table cheese lavosh with seasonal fruit gel? Besides these great food choices, Taverna also offers a comprehensive list of beverage from beer to champagne, cider, cocktails, wine and spirits. Are you ready for a special dining experience? Then book your Kingscliff luxury accommodation at Cabarita Beach Resort today for easy access to the new Greek-inspired restaurant, Taverna!